There are some people who still think that a 1990 World Cup ball, the Etrusca Unico, is up in orbit somewhere. When England midfielder Chris Waddle missed his spot-kick in a penalty shoot-out in the semi-final defeat to West Germany, the ball he made contact with went high over the bar – and just kept on going. Almost three decades later, the ball made by Adidas for the 2018 World Cup Finals in Russia has taken its inspiration from something that really is in orbit: the 1962 Telstar satellite. It’s still there, much like Waddle’s effort, long finished doing the job it was originally intended to do: serve as the world’s first communication satellite, instantly making the world feel connected by truly space-age technology. The spherical satellite was a joint venture between NASA and Bell Telephone laboratories (now AT&T), and is the inspiration Adidas called on for its latest World Cup ball, the Telstar 18. But it's not the first time Adidas has looked to the stars for inspiration – the Telstar 18 is a homage to the company’s iconic 1970 World Cup ball, the Adidas Telstar, which was the first to feature black and white panels, designed to make the ball stand out on the black-and-white televisions that were still in many homes. The 2018 version features redesigned panels that are pixelated (for durability) and propellor-shaped (to help flight stability). 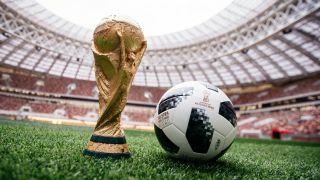 While the 1970 ball was originally introduced in Mexico – and kicked by, among others, Pele – the 2018 ball being used in Russia takes on a whole different meaning. The Telstar satellite, designed to help the world communicate, was put out of action because of the Cold War, specifically the radiation from nuclear bombs tested by both the US and the USSR. These tests caused the satellite’s transistors to fail, with the satellite eventually completely losing transmission in 1963 – but not before it managed to send hundreds of phone calls and telegrams. And communication is key to the new Adidas World Cup ball. The Telstar 18 ball has NFC technology built into it. Fittingly for something inspired by a satellite, it’s packing some of the very latest communication technology. There’s an NFC chip embedded into the ball, and there’s even a little Wi-Fi symbol on it calling attention to the tech inside. Adding this type of tech isn’t anything new for Adidas. It used a similar thing with its miCoach Smart Ball, which was designed to help coaches monitor performance. This time around, though, the technology won’t be measuring things like the power of the shot and speed of the ball, but it instead offers up information about the World Cup, and will allow users to enter a variety of competitions. This isn’t about tracking the ball but interacting with it, as a sort of fan experience that will work with both Android and iOS devices – although you will have to use a third-party app if you want to use it with iOS, given Apple’s lack of love for NFC. Speaking about the ball, Roland Rommler, Category Director of Football Hardware at Adidas said: “The original Telstar is one of the most iconic soccer balls of all time, and one which changed soccer design forever, so developing the Telstar 18 while staying true to the original model was a really exciting challenge for us. FIFA will be hoping these innovations will add to the beautiful game and not detract from it. While there have been some welcome changes to the World Cup ball over the years, including in 1986 when the Azteca became the first synthetic ball be used, some tweaks were rather less well received. In 2002, the Fevernova was a lighter ball and pitched as ”the most precise ball ever made”. In reality, it was one of the bounciest. But it was perhaps 2010’s Jabulani that became the biggest talking point. Adidas created a ball that was one of the roundest ever made, thanks to the use of eight panels stitched together. Players such as Spanish goalkeeper Iker Casillas hated the ball because of the unpredictable way in which it moved through the air, while strikers seemed to like hitting the thing. In the end, NASA figured out the problem – it was something called the Knuckle Effect. “Knuckling occurs when, at zero or near-zero spin, the seams of the ball channel airflow in an unusual and erratic manner making its trajectory unpredictable,” the space agency explained. NASA engineers were brought in to make sure the Brazuca ball, created for the 2014 World Cup in Brazil, wouldn't suffer from a similar problem. To make sure the Telstar 18 works as it should it has been tested by both international squads and some of the world's biggest club sides: Argentina, Colombia, Mexico, Manchester United, Juventus, Real Madrid and Ajax. The Telstar 18 may just be a football, but it symbolizes something even bigger than the world's favorite game: it’s an object that will connect 32 teams around the world, much like the pioneering, technology-packed sphere it was inspired by.